The UCC players and mentors celebrate with the Sigerson Cup. ©INPHO/James Crombie. 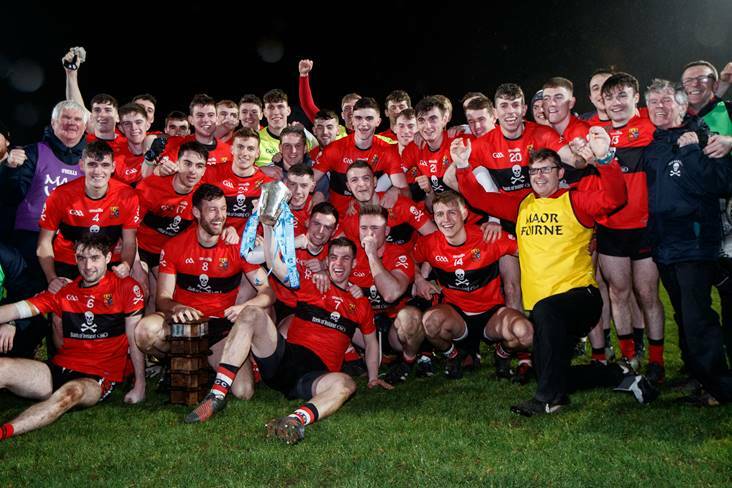 UCC as the champions of both the Electric Ireland Fitzgibbon Cup and Electric Ireland Sigerson Cup were truly a class apart in 2019 and they dominate the final 15 in both codes with no fewer than fourteen young heroes chosen across the two star-studded selections. Despite this there are five colleges represented on each panel with established inter county senior players such as Aaron Gillane and Sean O’Shea shining alongside up-and-comers James Bergin and Jarlath Óg Burns. The Electric Ireland Fitzgibbon Cup produced some thrilling games with only a single score separating the semi-finalists. UCC were worthy champions and contributed 8 star players with Mary Immaculate College (3), DCU DE (2), NUI Galway (1) and GMIT (1) claiming the rest of the spoils. The battle for the Electric Ireland Sigerson Cup was also a close fought affair and again there are five third level institutions contributing star players with UCC again being the dominant presence with 6 star players after a stellar final performance against a well drilled and determined St Mary’s University College who have 4 star players listed. NUI Galway (2), UCD (2) and LYIT (1) also feature on the football panel. Also named this year were the Electric Ireland Hurler of the Year, Shane Conway from UCC and the Electric Ireland Footballer of the Year, Sean O’Shea also from UCC.